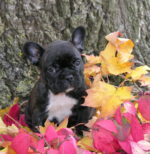 Ashland is a Beautiful Fawn with Black Mask French Bulldog Female. 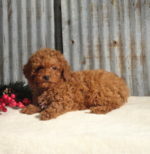 Anna is a Rare Mahogany Red Toy Poodle Female. 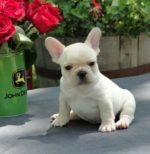 Faith is Grand Champion Sired Cream French Bulldog Female. 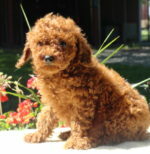 Benjamin is a Rare Mahogany Red Toy Poodle Male. Maggie is a Brindle with With White Chest French Bulldog Female. 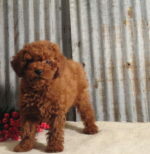 Violet Is A Rare Mahogany Red Female Toy Poodle. Hello! Welcome to Norton Farm Kennels! 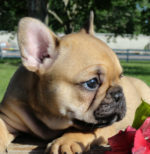 We offer French Bulldogs, Free Lance Bulldogs and Toy Poodles at our small family licensed kennel. We are proudly inspected by AKC and the State of Missouri. Our Family farm is nestled on 8 acres in St. Joseph, MO. Our puppies are raised in our home where socialization skills are started with our 3 young boys, along with a host of other animals you will find on our farm. We start by breeding for excellent health and conformation to the standards set forth by the American Kennel Club. Our foundation breeding stock has been carefully chosen. We currently have two veterinarians that work with us and our dogs. Dr. Griffin is two hours away from us but, specializes in the Bulldog Breed. We also have Dr. VanPetten who is close to us for routine and emergency visits. We feed our babies and adults Royal Canin dog food. We also give Nuvet vitamins to ensure that our dogs are at optimum health. We recommend that you give these vitamins to your new little bundle of joy! With a combination of lots of love and care these puppies are sure to please! Our babies are pre-spoiled and are sure to be your next new best friend! All of our puppies come with a one year health guarantee, full AKC registration, have been checked by our vet, and had their first series of vaccinations. Shipping is also available for an additional charge. We welcome any questions about our babies before and after the sale. Please feel free to contact us with any questions! If interested please contact us! !